On Tuesday July 26th, I participated in a wonderful tasting of Beaujolais wine from Georges Duboeuf, paired with different kinds of burgers. This was a "Twitter Taste Live", hosted by the fine folks at WineTwits, with wine bloggers from around the country sent packages containing three different Georges Duboeuf Beaujolais wines, recipes for burgers, fact sheets, and other supplies. Our title being "Burgers With a Side of Georges Duboeuf Beaujolais". The idea being to host a tasting of the Georges Duboeuf wines and cook up a spread of burgers to highlight how well the wine and burgers pair together. Very nice summer tie-in and more evidence of the Georges Duboeuf firm trying to move past l'affaire Duboeuf of 2003/2004. In addition to the Twitter participants, there was one location where a chef (Bob Waggoner aka Chef Bob) was cooking up the burger recipes for audience members, and a representative from Georges Duboeuf was on hand to discuss the wines and answer questions from both the Twitter and live audiences. When I got the email invite, I was really excited to participate. Often I've watched from afar as my fellow wine bloggers get great wines to taste and tweet about. Unfortunately some of them do a crappy job of writing up the wines and tasting experiences, but that's a bit tangential to this blog. Back to the point, I was sent the package of three bottles of 2009 vintage Beaujolais, from Beaujolais-Villages, Julienas Chateau des Capitans, and Brouilly. All were from Georges Duboeuf and were priced at $9.99, $17.99, and $13.99 respectively. The three recipes to pair with these wines were for angus burgers, grilled portabella burgers, and turkey burger sliders. I went a different route. Instead of dropping some coin on all the food needed for the three recipes, and considering that only a handful of my friends made it over, I made two "burgers". One, using the frozen Kobe beef patties from Trader Joe's and the other using some albacore tuna steaks. With the beef burger, I decided on swiss cheese and bacon, along with the usual lettuce and tomatoes. Instead of slathering on the catsup and mustard though, I made a garlic sun-dried tomato mayonaise and used that. The reactions ranged from "mmsogoodmmmmm" to "holy $*@! you nailed it!" and even a "let me eat in peace!". Our little group's consensus was that the Brouilly paired best with this burger because it had enough acid and fruit to help with the richness of the beef and cheese while handling the bacon and rich mayo with it's streak of fine-grained tannin. That's not to say the other wines weren't also good pairings but I felt the Beaujolais-Villages was too soft and fruity, too round to deal with the complex textures in the food. It had lots of ripe fruit and some good clean acid, but remained linear and fairly simple. On the other hand, the Julienas was an excellent wine but I felt it was too young and needed more time in a decanter or even a few years to fully integrate the tannin and fruit together. Next up was the albacore-steak burger, which I chose to make in two versions, with bacon and without bacon. The cheese was a sharp cheddar, and I did use the garlic mayo spread that I had made previously. Here is where the Beaujolais-Villages shined with it's ripe fruit and minerality playing well off the sharp cheddar and clean tuna flavors. To me the bacon was a nice savory dimension, however, my friends thought it was a bit distracting. I can see their point of view and next time plan to try the tuna steak with a different preparation. All in all I think the tasting was a success, I enjoyed following along with the WineTwits streaming audio and video, they did a superb job of hosting this event. I liked how the moderator kept the crowd engaged but also moving along from wine to wine. Chef Bob is entertaining, outgoing, and loves to engage his audience. Plus his food looked delicious. Bright purple, and I mean really bright, glistening purple. Simplistic but for less than $10, what did you expect? I enjoyed the ripe black fruits, this was all voilets, plum skin, and blackberry to me on the nose. Those came through on the palate too, bringing a dumptruck of fresh acidity and wet river rock. Silky smooth tannins and a solid if average-length finish. Not too bad at all and a wine to quaff on a Wednesday night with burgers or a pizza. I'd still pick the 2009 Joseph Drouhin Morgon or 2009 Louis Jadot Beaujolais-Villages at around $10 though. What a smashingly fun wine! Is "smashingly" even a word? 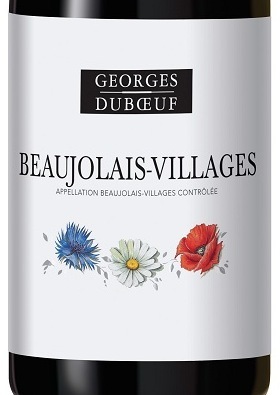 Who cares, this is a cost effective Beaujolais that expresses fantastic sense of place. As I kept shoving my nose into the glass, I picked up things like crushed violet petals and the smell of a wet gravel driveway. There was some fruit here, more of that plum and even something like ripe blackberries. The acidity was perceptible even on the bouquet, it made my mouth water and beg to taste the wine. The '09 Duboeuf Brouilly was my favorite wine of the night, a bright burst of acid and that savory, spicy blackberry/plum/violet melange working together with firm tannin. In a word, delicious! At a suggested retail of $13 and available for around $10, I'd buy six bottles to have on hand through the summer and into autumn. The most expensive Beaujolais of the night, though not a terribly expensive example of a Cru level Beaujolais by any means. 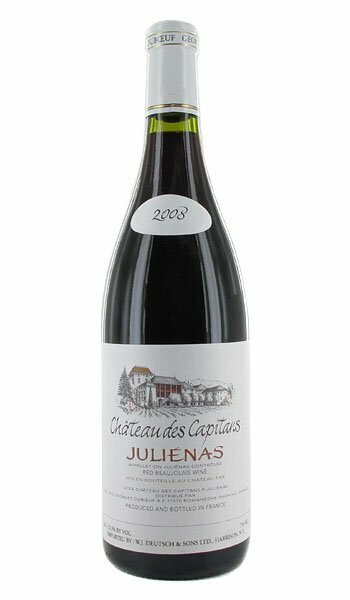 All the fruit is from the Julienas AOC and the Chateau des Capitans sub-region where the wine sees some time in oak barrels before bottling. Of the three wines I tasted for the "Burgers With a Side of Beaujolais", this had the most potential to gain complexity with some bottle age. On the 26th, it was young and racy, lots of acid and firm tannin enveloping cinnamon toast, black currants, sour cherry, and boysenberry. One day after opening, the acid started to balance with the fruit and this Beaujolais got even better. It paired well with the Kobe burger and at a suggested retail of $17.99, is a nice pick for mid-week or casual weekend sipping with your friends. Home made pizzas or even something as simple as meatloaf would be a fun pairing. I think this tasting went a long way to dispelling the myth that Beaujolais wines aren't good quality and that the only juice from that area is Beaujolais Nouveau. 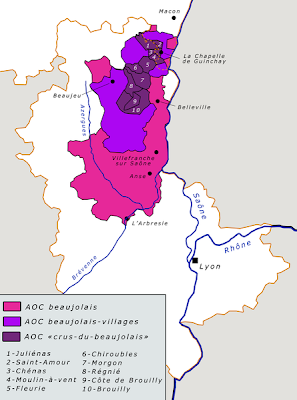 2009 is considered one of the best years of late by some critics, others see it as creatings overripe wines that aren't historically what the best of Beaujolais has produced. My take: These wines are great quality at unbeatable prices and offer us wine lovers something new and relatively different to explore. Sure they might be more fruit-forward and less inclined to drying acidity than before, but who cares? In 2009, the terroir produced these low alcohol, delicious examples of gamay noir and they're all worth a shot. I want to thank the people at WineTwits for inviting me to taste and tweet. For those of you who follow me on Twitter, this is why I kept using the "#GDandBurgers" hashtag. I apologize if I flooded your tweet-streams! you can follow WineTwits and hang out in their next live tasting, I hope to see you there! That albacore-steak burger looks unreal! The albacore-steak burger was ridiculous! I only wish I owned a bbq because that would have been the crowning touch. Next time I will go out to the community bbq's at my apartment and use them to grill up some more tuna and perhaps change up the cheese selection too.